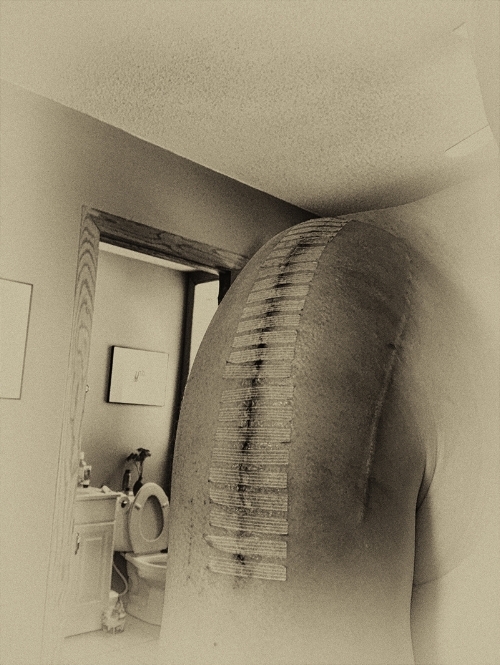 Six days since the reverse arthroplasty at Mayo Clinic. Performed by Dr. Sanchez (from Spain) and his talented team of surgeons and nursing staff. This surgery is somewhat new in the United States, but has been practiced in Europe longer. The humerus (top bone in arm) has a metal shaft with a cup on the end and the Glenoid (cup at top of shoulder) now has a metal ball...The opposite of our normal anatomy, which helps with patients whose rotator cuffs are destroyed. After immobilization for 6 weeks, there will be up to six months of physical therapy to retrain my brain and the new muscle and tendon arrangement.